Issue #6 and Box Set Delayed! According to Co-Editor David Mariotte, the Issue #1-4 Box Set due out today 6/16/18 and next weeks upcoming issue #6 previously scheduled for 6/20/18 have both been delayed due to issues with the printer. 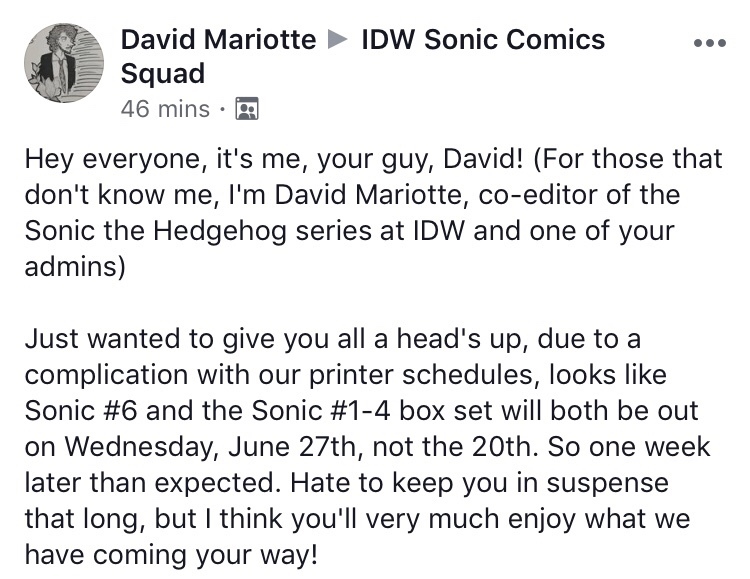 This news was announced in the IDW Sonic Comic Squad Facebook Group. No additional details have been given concerning the delay, but both items have been pushed back to 6/27/18. Previous BumbleKast #70: What’s Tangle’s Favorite Color?